So I'm an IT guy, love gadgets, am always intrigued by new ideas, am drawn to things that aren't Apple products, am an early adopter of all things Google, am a partisan of Linux, and just like cheap stuff. Got all that? Well, that's why I ordered a Google Chromebook from Amazon a week and a half ago. For all those reasons and more I'd been interested in Chromebooks and the Chrome OS since Google came out with its first prototype in 2011. Somewhere in the future, Google proposes, the entire Earth will be blanketed with free, high-speed internet for all. It's already happening in many places with the growing ubiquity of Wi-Fi. Once that occurs it is possible to do and store everything we've been doing and storing in our laptops on the internet -- aka the cloud. Google Chrome is an operating system that does that now. Based on Linux (which is free and never breaks) and doing everything inside a browser, Chrome makes light, thin, cheap machines possible that start in seconds. My problem tho had always been that all the Chromebooks were tiny little things with 11" screens. 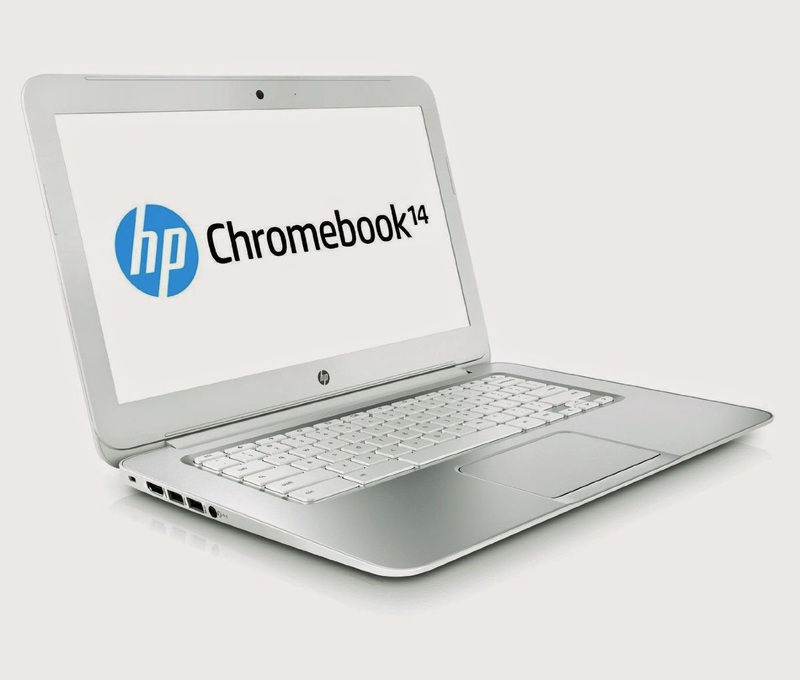 But larger versions are being built now, like my spiffy new HP Chromebook 14, so I got one. If you decide you want one, be sure you DON'T get this one, an earlier version from HP that needed a much better processor, which it now has. I'm very much loving my Chromebook so far. Google Chrome apps enable me to do Microsoft Office-type things (e.g., word processing, spreadsheets, powerpoint slide shows, etc). I can store reams of stuff in Google Drive, and as a bonus for my purchase they offered a free upgrade from 15 GB to 1 Terrabyte. That should hold me. Of course there are apps for music, movies, books and such like. A Chromebook isn't for everybody tho; it's definitely taking a leap into the future. The biggest thing, of course, is that it doesn't do much without an internet connection. You can still word process, send emails and some other things, and Chrome saves it all until the next time you're connected and it can upload it all. If you're willing to pony up $9.95 a month for Google Music you can have offline tunes too. There is a shortage of decent apps, but Google announced last year that they plan on making Android apps run on Chrome. So far there are only a handful of those but opening Chromebooks to the Android Play store will make them much more inviting devices.